Iguana Point… Not Just for Iguanas! What bar have you visited lately that has its own volleyball net? There’s one in the Galapagos Islands! If you’re lucky enough to visit the natural haven of the Galapagos during a stay in Ecuador, and you get a little, uh, thirsty from marveling at the ecological wonder of the place, stop by the Iguana Point Bar on Isla Isabela. Okay, it’s a hole-in-the-wall. But the nightlife in the Galapagos doesn’t offer much else, except for spectacular sunsets, and you have the best view of those from your barstool on the bar’s terrace. Located on the pier of Red Mangrove’s Isabela Lodge at the end of Iguana Point (not saying it’s the most creative name), the bar is surrounded by crashing waves and spectacular views that you can enjoy from an outdoor table. Iguana Point Bar is the happening location: everybody goes there. Adventurers flock to this funky, ramshackle little bar after a long day of hiking, swimming and snorkeling. It’s casual: no need to worry about the amount of dirt and salt water on your person when you arrive. Just grab a beer and dance the night away to the ultimate beach music: salsa and reggae. It’s considered a prime dating spot. Hungry? Their food is home-style, served sometimes by the bar’s owner, Jimmy. He assures his customers that his vegetables are all washed in agua purificado and therefore are perfectly safe to eat. 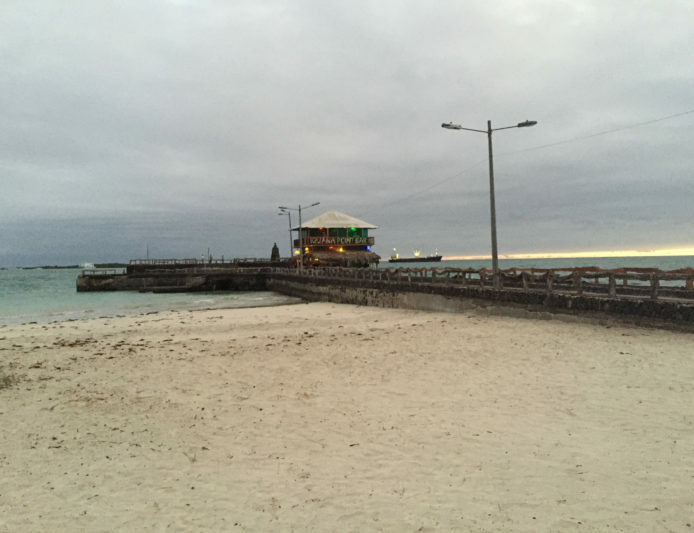 The Iguana Point Bar has been well loved by locals and tourists alike for decades, and the vibe is cozy and charming. Have a glass or five of aguardiente, the traditional liquor of Ecuador, or maybe an Agua Loca cocktail, and toast your fellow travelers and tour guides alike! Don’t forget to have one for the giant tortoises.